Earlier this year the Center for Asian Art in the Dr. Helga Wall-Apelt Gallery of Asian Art opened in Sarasota, Florida. 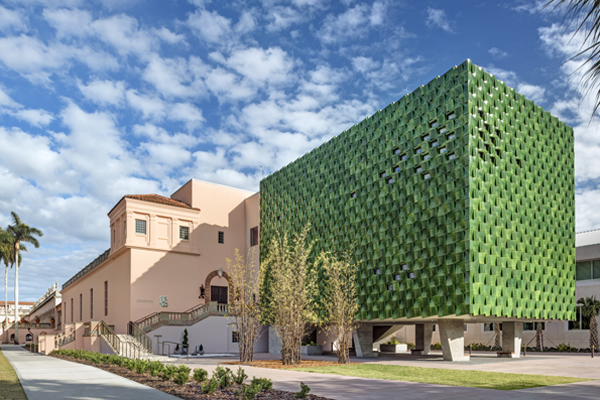 This bold addition to the Ringling Museum campus has received early recognition, receiving an award for "Innovative Use of Ceramic Facade" from the AIA Florida Gulf Coast chapter and an "Award in Design Excellence" from the Boston Society of Architects. Machado Silvetti is collaborating with Corgan on a major expansion to the UNT College of Visual Arts & Design. The project will unify the college's esteemed undergraduate and graduate programs into a new consolidated center for art and design production, research and exhibition. Upon completion the facility will accommodate over two thousand students in 240,000 SF of 21st century, trend setting studio, workshop and teaching spaces for innovative and interdisciplinary arts and design education. On September 30, 2016 the AIA New England presented Machado Silvetti with the "Honor Award for Excellence in Architecture" for the Kevin and Karen Kennedy Center for Theatre and the Studio Arts. This project at Hamilton College in Clinton, NY is sited directly across from the Wellin Museum of Art, also designed by our firm. These two complete a collection of buildings around a reconstructed pond, now collectively known as the arts quad. Attending the awards ceremonies were Principals Stephanie Randazzo Dwyer and Ned Goodell, along with Senior Designer Nate Fash, now on the architecture faculty at Roger Williams University. Jeffry Burchard will be at MassArt on Tuesday, October 18, 2016, participating in a discussion series titled the The Evolution of an Idea. The discussion is organized by the BSA for the MassArt AIAS. Stephanie Randazzo Dwyer presented at the American Alliance of Museums Annual Meeting in Washington, DC in May of of this year. The theme of her talk was the relationship between the Entrance and the Experience of a Museum. Jorge Silvetti will be moderating a lecture about practice in China at the Harvard GSD, featuring Calvin Tsao and Zack McKown of the New York based design firm Tsao & McKown. The lecture takes place October 12, more info HERE. Our Silver Spring Civic Building and Veterans Plaza received the 2015 Montgomery County Design Excellence Award. The jury said that this projects is "a great collaboration between architecture, landscape architecture and urban design. This is a beautiful example of how the public sector can lead quality modern design. It is a great example of how to make a place." Stay tuned for the public release of Machado Silvetti's design for the DOT Commercial Development in Buenos Aires, Argentina and the Pomona College Museum of Art in Claremont, CA. And finally we would like to welcome Daphne Binder, Julian Funk, and Giancarlo Montano as new Designers in the office.